We wore her out well - we left for SW at 11 am got inside the gate by 11:30 after getting passes for Gigi, Pops and Jeremy (now they can come back again with us! yay!) We went to see Viva (where the porpoises and belugas didn't want to perform for that show - in fact the belugas didn't come out at all and they had to stop the show to encourage the porpoises to do the tricks instead of just swimming around) then we went to see Abby's favorite things - the horses then the dolphins and the fish. Then Abby said she wanted to eat so we got some lunch then headed to the Lost Lagoon to cool off and swim. We went and let Abby splash in the kiddy pool, then to the lazy river where Abby likes to float - once she has her life jacket on and gets her confidence up she'll make you let go of her so she can float all by herself in the lifejacket. Gigi, Pops and Jeremy seemed to enjoy seeing her giggle while she floated and swam between them. Then we went to the slide and Abby went down with Gigi. Finally we made it to the wave pool and Abby splashed some in the tide pool area behind it and we went in for a short set of waves. At that point we headed home so we could grill some dinner. 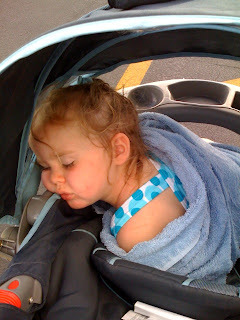 Abby sat in the stroller and was closing her eyes and fell asleep before we even left the Lost Lagoon area - we weren't even out of SW yet. I can count on 1 hand how many times she's fallen asleep in the stroller. She power napped while we got drink refills and all the way to the truck. Then she was good for the rest of the day. We had dinner then everyone even Daddy this time headed back to the park for the late shows - Sea Lions tonight (my personal favorite show) where they make fun of all the other shows and Shamu Rocks Texas which was cool because the Orcas did all their tricks and did lots of jumps. In all we had a great day and can't wait for Pops, Gigi and Jeremy to come back and go again since we had so much fun with everyone.